Welcome to winter! Except that it’s still fall… in Florida…. We had to wear something other than flip flops which was so weird. Then, I had to put an actual coat on my children, and not just to school! Even home from school! It was just weird all around. It would be better if there were a picture of them wearing said coats, but alas, I do not. Oops. Hey, we can’t all be perfect, right! Anyways, back to cold! Whenever it gets a little chilly, I automatically want something for dinner that will really keeps you warm! 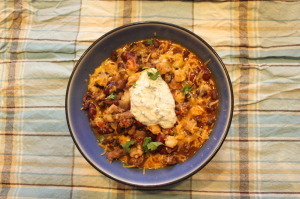 Growing up, my mom used to make this amazing, delicious taco soup and oh man, it was so good. Like, eat it for breakfast, lunch and dinner, so good! I craved it like crazy when I was pregnant with Harper and made it immediately after my mom emailed me the recipe. And it was so worth it! Even with all the taco seasoning, ranch packet and block of Velveeta were worth it! 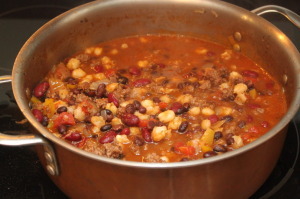 So, here is the recipe of my taco soup. And I got pretty darn close! I even made up an extra topper to mimic the creamy velveeta! Taco soup gets a healthy update without the taco seasoning, ranch packet and velveeta of my beloved mother's version. Brown the beef in a large pot over medium high heat with onion and bell pepper. Cook about 5 minutes to soften onion. Add chili powder, cumin, garlic and onion powder, oregano and cilantro. Stir to combine. Add salsa and season with salt and pepper and simmer for 3-5 minutes. 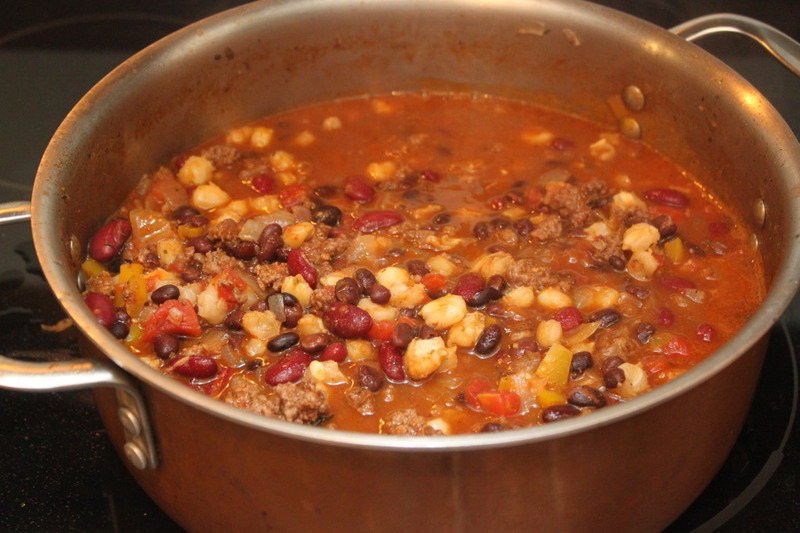 While spices and beef are cooking, drain black beans, kidney beans and hominy. Rinse. Add to pot and stir to incorporate. Add chicken stock and 1 cup of water and diced tomatoes. Bring to boil on high. Turn heat to low and cover. Simmer for 20-30 minutes. 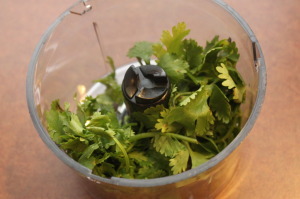 While soup is simmering, prepare cilantro cream. Hand chop or blend cilantro until leaves are very finely minced. 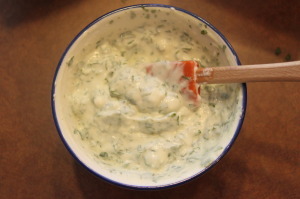 Mix sour cream and half of lime juice in a small bowl. Stir together with cilantro and set aside. When soup is done, add juice from the other half of lime and stir. Serve warm with cheese and dollop of cilantro cream. Thankfully this will be all gone by the time it gets back up to 75 degrees in a few days! Please let me know what you thought about the Taco Soup! I would love to hear!